Posted on June 23, 2017 at 2:31 pm. At Imagine It Studios, we take social media very seriously. Almost too serious, you can say. Obviously, the more creative you are with your posts, the higher the chances of gaining followers, shares and likes. We’ve found that it really helps to create unique strategies and photo styles for each client. This way, it’s sure to prevent each social post from being repetitive and boring. With the subject of photos, we understand that catching someone’s eye with a social media post is the most important thing to do. Your smartphone alone offers hundreds of photo editing apps to do this, but which should you pick for your business’s social media accounts? We asked our in-house social media strategists about their favorite apps that help get the job done. Are you looking for unique ideas for your business’s social media account photos? Contact Imagine It Studios today to lend you a hand! 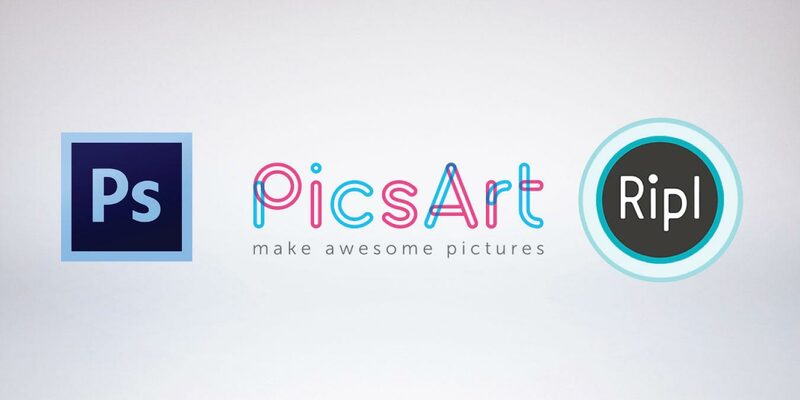 Like PicsArt, Ripl is available on both iPhone and Android free of charge. Best of all, it’s very popular with small businesses everywhere! Be sure to bring your photos to life with the animation option! You can drag and insert your company logo and even add your own music! There are many customizable tools and features that will make every post your own. Let’s not forget to mention that you’ll have access to more than 100 premium designs, plus new designs added weekly! Most are familiar with Adobe Photoshop on desktops and laptops, but did you know that it can also be used on iPhones and Androids like the two previous apps we spoke about? Dan is another of our social media specialists who’s faithful to this app both on and away from his desktop. “I’m using Photoshop right now on my iPhone as we speak and I love that it has so many tools to make your project stand out above all others.” The mobile app comes with correction tools that you may already be familiar with on the tool’s desktop version. Managing our clients’ social media accounts is something that takes careful planning, creativity and, most importantly, originality. Over time, we’ve noticed that the more original and fresh a post is, the higher the chances of gaining followers. If you feel that your business’s social media or digital marketing efforts is lacking, then we can help you. Contact our digital marketing agency in McAllen today to get started! Looking Serene: Proudly Introducing Avalon Spa & Salon’s Newest Website!